An eagle-eyed reader over at MobileRead Forums reports that Kobo is testing a new way to show a book's stats. Yesterday GeoffR posted a screensnap which showed that Kobo is considering a more graphic way to show details about a book, including length, an estimated page count, and how long it will take to read. Kobo is still quietly testing the new ebook description page in beta, so they're not showing it to everyone. They also haven't shared any info on when it will be rolled out to all users. Luckily, the same cannot be said for the new reading stats email. I haven't seen it myself, but I've heard a couple reports that Kobo is now sending active readers a precis of their reading stats every quarter. And thinking of stats, did anyone else get the reading activity email earlier in the month? I don't remember it being mentioned. 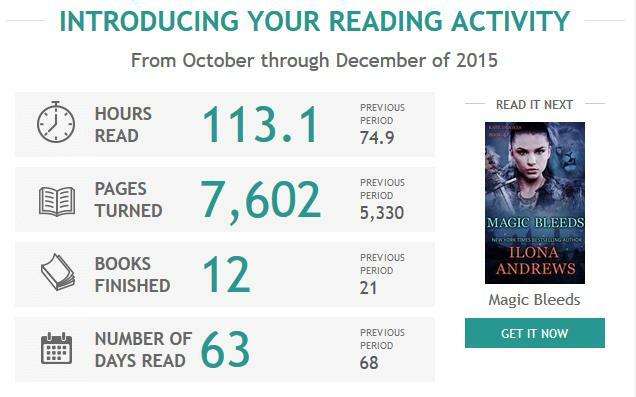 It shows the stats for my reading for the previous three months. But, it is only for "Kobo eBooks", so only books I purchased from Kobo. I like it, but as it only captures maybe half of my reading, it isn't very accurate. So what do you think of the new stats? I find the new book stats more colorful and easier to scan, but not necessarily more useful. I've never used those details to plan my reading, have you? Thanks, GoeffR, for the heads up! What I read and how much I read is between me and my reader. There had better be a way to shut off that spying. Nice, but as an indie publisher I’d love to see this type of stats, i.e. granular averages by day/week/month (vs. previous month) for my titles in Kindle Unlimited. That just means I will not be buying a Kobo ereader. @SteveHut NO you do not need to know anything beyond that money was paid for your books. About the only times I connect an e-reader to the Internet are to register it and to correct its clock. I recently purchased an e-book through Kobo. I downloaded it via the Kobo desktop app. When I tried to put the e-book on my Kobo e-reader, the DRM wouldn’t let me open the book- on a book I had purchased. And what I attempted to do didn’t work. Result: I found a way to strip the DRM from what I had purchased from Kobo, so I could read it on my Kobo e-reader. I won’t be making many more Kobo e-book purchases. No reading stats for me. Of course, wifi has been off since I bought the device. The first thing I did was disable reading stats. I don’t care about reading stats, and this update won’t change my mind. I just updated my kobo Aura HD to the Aura ONE… lost all stats including books read and over 2000 hours of reading. Customer service says stats don’t transfer from one device to another. That seems odd. Kobo has taken the time to build reading stats into the software but doesn’t allow the stats to carry forward to a new reader that they make. I know it’s a little, silly thing, but seeing my reading stats back at 0 is tad disappointing.